On 15 December I shopped at Riccarton Pak’nSave with a group of other young people. After purchasing items at a self-checkout directly in front of one of your staff (really, she was right beside me), she requested to search my bag. I had not touched the bag during my visit so this request was not based on any actual evidence that I had attempted to steal something, like from a store detective or a camera. It was extremely obvious that this was not a random search, as she called it. It was because of my age. Three other people from our group were selected for a “random” search. I wonder how many women with handbags were searched that day? I know my friend that came through the self-checkout after us wasn’t. I waited for the rest of our group and left the store. I was followed by a store manager who put his arm touching up against me, and tried to stop me from leaving. I declined again, which I have the right to do, no matter your signage, and walked away. It’s disgusting to treat your paying customers like this. Do you consider that bags contain personal possessions? That most people wouldn’t decline your request to search, because it makes them look and feel like a criminal? That searching personal possessions could reveal, say, a private medical condition? I wonder what the purpose of these “random” searches are. Say I did consent to the search, I had items in my bag that I didn’t buy or steal from Pak’nSave, but that you sell. I didn’t have the receipt. What would happen then? Would you accuse me of stealing those items? Would you call the police on me? If not, why are you searching young people? Scare tactics? That isn’t the definition of a reasonable search. If it is your policy to target young people or people with backpacks (read: young people), it needs to change. It is discriminatory and wrong. If you weren’t the only supermarket at Westfield Riccarton, I wouldn’t shop with you again. Is it definitely true – even with signs up (even if you can see them BEFORE you entry), they actually have no right to search your bags, even though you had the option of choosing to not enter the store? not looking for legal advice, just would like to know. Thanks for your comment. 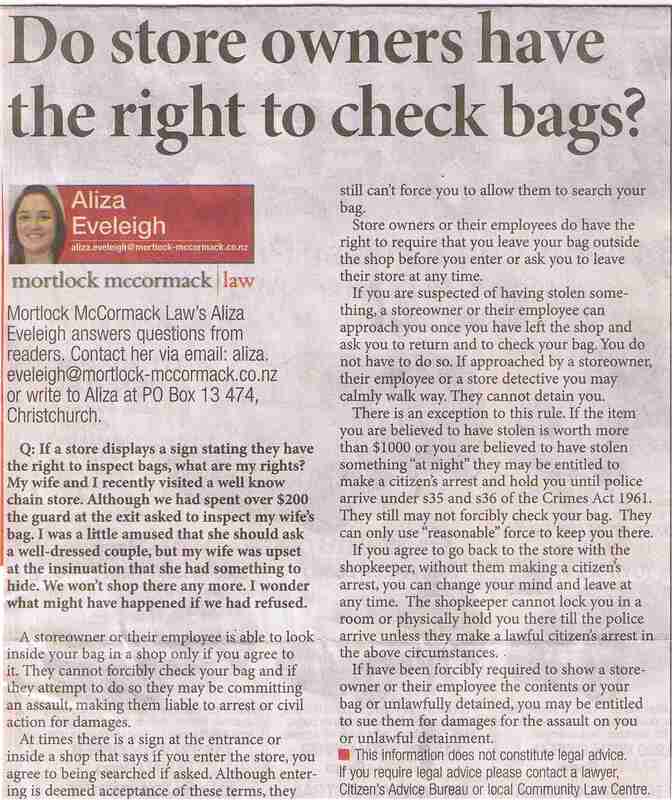 I edited the post and included a column by Aliza Eveleigh on bag searches. The problem I have with the choice argument is that if this isn’t challenged, all supermarkets could implement similar policies, then no one would have a choice whether they were subject to search or not (because nearly all of us need to go to the supermarket). I’m not a lawyer (and I don’t play one on TV), but venues generally reserve the right of admission. It’s strange though because in my experience searches aren’t very thorough and if you wanted to get something in you would be able to. I don’t think they achieve much, apart from violating people’s privacy/personal space. Parallels could be drawn to other relatively public places where you wouldn’t expect to be searched, but for some reason society accepts searches at events without question. Well said, Matt. I’m over fifty and was stopped with my bike pannier on my way out of Bunnings today after an actual purchase! Not knowing fully my rights and being flustered by a pugnacious door minder, I allowed her to search my bags. Wherever I am next time, I will decline. As if we didn’t live enough in a police state! My anger at Bunnings is such that I’ll go to Placemakers next time. Did it look like a lot of people were being searched? Maybe Bunnings has a different demographic of thief than Pak’nSave haha. Agree with you about the police state and that not many people know they can, or are prepared to decline a search. The “innocent people have nothing to hide” argument just doesn’t hold up.